Good luck with the move Tom! I’ve been following your blogs since moving back from the US a few months ago. Hope you’re going to carry on with the commentary. Very best of luck to you and your family Tom. Aloha Tom, and best wishes with the relocation. good luck Tom, have a good one :), how are you managing the cix from there, going to the IT midsummer event in murphys, are ya around ? Hope the move goes well. I couldn’t survive out there at all. After 28C sun last weekend I remember that I’m better off in a temperate climate. we’re in Barcelona, and while we have great DSL, and fast, it takes about a month to get it connected! Movistar will have you up and running in a few days, and then you’ll need to move to some other provider, if you plan to surf the web faster than a snail! 😉 Good luck and enjoy the journey! Spain has better broadband than Ireland. And remember your pale, gingery countenance will require a lot of protection out there. Phew – all the best with that. Good luck with the move..
Best of luck to you and your family Tom! We’ll miss you at the Cork Open Coffee …. Enjoy the sun and send some our way occasionally please! Best wishes with it all. I hope you can keep up the blogging and sharing. Good luck to you and the family. Hi Tom, the cervezas are in the fridge, the gambas are simmering, calamres for lunch and a quick tapas, nevermind the jamon serrano and queso manchego! You will enjoy it here (im Marbella ok fair enough not to far from sevilla though) but be prepared for a culture shock at the same time! Look me up when you arrive Tom and if I can be of any assistance its “no pasanada”! Hopefully we’ll give you a good sending off on the 17th. Best of luck with the move Tom. thanks a million for the good wishes everyone. Looking forward to seeing as many as possible of you at the Hasta Luego Blogger’s dinner Conor is organising on the 17th. I’ve nice memories from Spain and I’m sure you’re going to enjoy your relocation. In a very short time, I think your boys are going to forget what rain feels like. Good luck to you Tom, we may yet see you at some stage. Hopefully the summer will *really* have arrived by the time you get here. It’s been cool so far. Tom, I’ve lived full-time in Barcelona since 2003 (while retaining my Irish clients (and gathering some Spanish ones)), let me know if I can help with anything, drop me a line if so. Good Luck with the move, from yet another expat over here! Spain is a fantastic country to come to live, particularly if you can learn the language and integrate. Well worth the effort! Sure we will see you at the it@cork midsummer brewery event on thurs night. I’ve been following your tweets and it seems a hard step forward, but I’m sure you’ll love Spain. 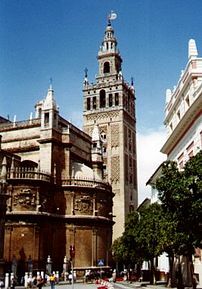 I hope I can drop in soon, there are so many interesting things in Seville!! And, of course, I hope to see you back in Valencia!! Best of luck in this new stage! Great selection – Seville is a nice place to live. Best of luck with the move Tom…. and here’s betting that, when it comes to broadband at least, you’ll find more scope, choice, speed and value in Seville than you ever could here in Ireland. All the best Tom ! I hope the fuel protest finishes before you get there. Taxi drivers had BCN blocked on Friday when I was out there, I had to walk in from the perimeter. Trains weren’t carrying passengers out to BCN on Friday either, in solidarity with truck drivers. These last five days shops are out of milk. Cooking oil not available either. Passing back thru BCN today there were noticeable gaps in the normally well-stocked shelves of the duty free outlets. It’s taking a bite to be sure. Great time to go, Spain will be the happiest place on Earth for a few years after the Euro 2008 win! I for one look forward to the day I leave England and head for more comfortable climbs, it’s not a matter of if, it’s when!